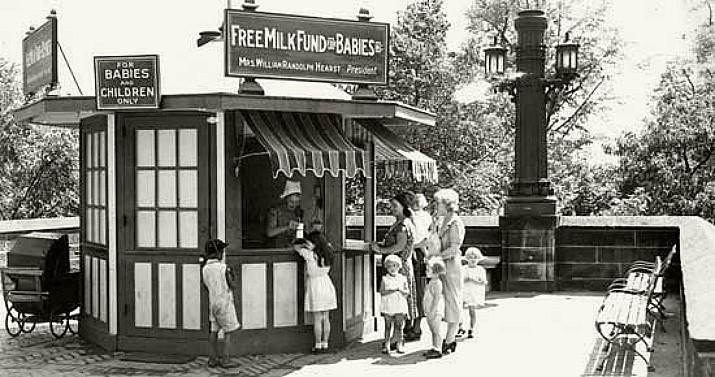 Milk stations popped up everywhere: City Hall Park, Mott Street, Cherry Street, Washington Street, East 66th Street, Lenox Avenue, and eventually Columbus Circle (photo below, circa 1930), run by William Randolph Hearst’s wife. After raking in a fortune as co-owner of Macy’s, Nathan Straus devoted himself to making life better for New York’s poor tenement dwellers. In the depression years of 1892 and 1893, he gave away food and coal to thousands, and built shelters for the homeless. He also turned his sights toward what was dubbed the “white peril,” the raw, bacteria-ridden milk city children routinely drank. Straus and many experts believed that the milk was linked to New York’s high childhood mortality rate (two of Straus’ own kids had died young). When Straus showed health officials that childhood mortality rates had been drastically cut in neighborhoods with milk stations, the city — and soon all cities — banned the sale of raw milk. Central Park and Prospect Park had their own milk stations: the dairies.